Shifting the performance curve is all about driving results, enhancing revenue, and improving margins. Our model and methodology allows organizations, their leaders and associated work teams to capture more value with existing resources. In a ‘do more with less’ economy, this is the right strategy for these times, clearly differentiating you from your competition. 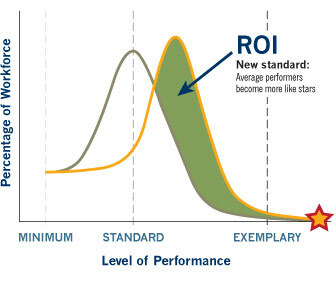 Exemplary Performance’s unique methodology has ALWAYS been focused on this “secret” for improving performance – benchmarking your stars in order to shift the performance curve! As a leader you begin every day with options on how to improve the performance of your organization. You can shift your strategy, enter new markets, invest in new products or acquire a competitor. You can also jump on another bandwagon – talent management, Six Sigma, lean manufacturing, advances in cost accounting, off-shoring various business operations and so forth. All of these alternatives are valid and can drive shareholder value. They also are initially costly to implement and consume significant management attention. We want to provide you with an additional option – a model for driving improved business results by replicating the accomplishments of your star performers. The advantage of this approach is that it is derived from the current performance of those stars, so you know it is possible within your current structure and culture. It also has the advantage of being cost-effective and quick.